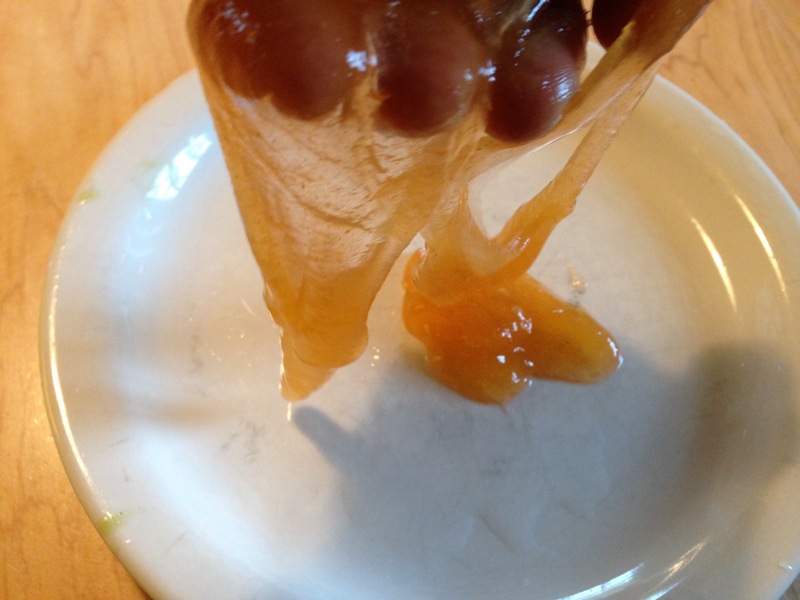 Use fibre powder and optional flavouring to make a slime that is edible (though not delicious). 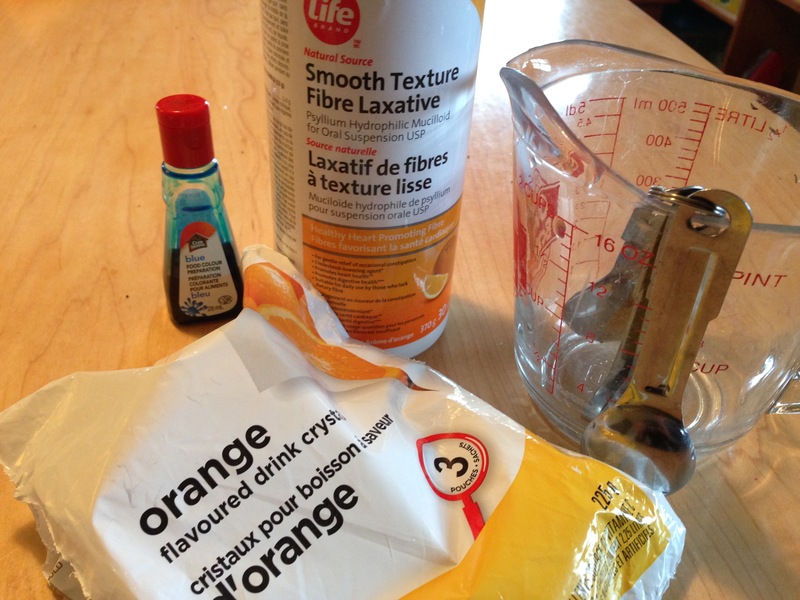 Mix 1 tspn fibre powder to the half cup of water and stir until the grains are evenly mixed. Optional: for better taste add 1/2 tspn drink mix. Stir in. Optional: for colour add 1 drop food colouring (e.g. 1 drop blue dye in orange flavoured drink mix makes a great snotty green colour). Stir in. Take it out, stir. briefly, and allow to cool for a few seconds. Microwave again until the bubbles rise up the container. Repeat: Take it out, stir. briefly, and allow to cool for a few seconds. Microwave again until it boils again. The more times you repeat this cycle, the more rubbery your flubber will become. 3 times minimum. Make sure it cools a little between heating. If with these directions, it is still too goopy, try with less water (the orange slime in the pics is with 1/4 cup water, the green with 1/2 cup). Do not eat if it has been stored for a while and harmful microorganisms might have started growing in it. Psyllium (abbreviation of psyllium hydrophilic mucilloid; also the name of the plantain plant whose seed husks it comes from) is used as a food grade fibre. Fibre is the part of plants that our bodies cannot digest, and is found in many grains, beans and vegetables. 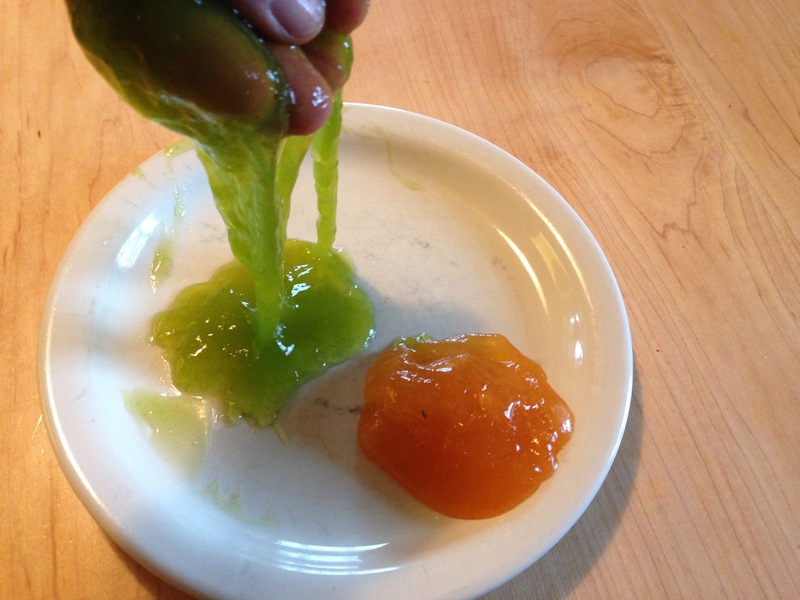 Mucilages (which behave similarly to "gums") mix with water, to make a goopy mixture. The mixture is made up of liquid water droplets suspended in the solid mucilage. The term for this kind of mixture is called a "gel", which is a kind of colloid (see attachment for summary of different kinds of mixtures). During the making of the flubber, the heat from the microwave increased the rate that the water was dispersed in the mucilage.